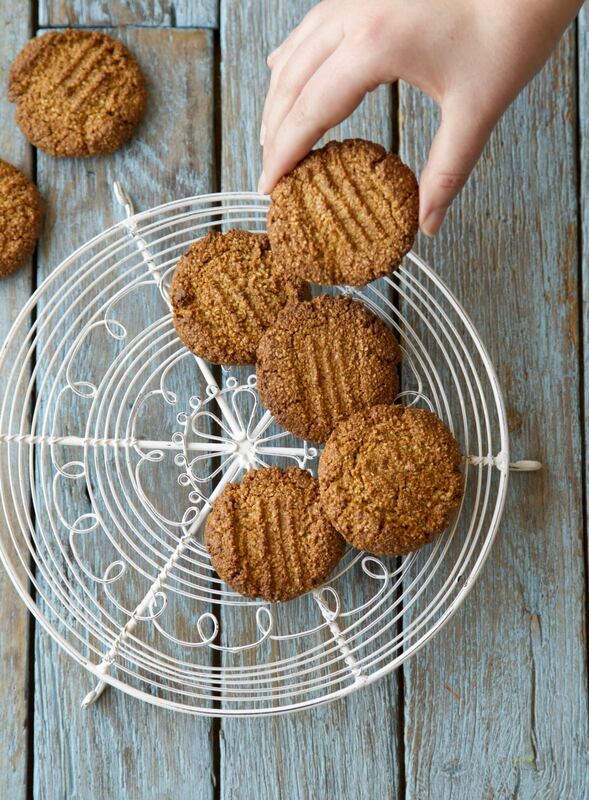 Gingernut Biscuits with a freshly brewed cup of coffee is the perfect afternoon treat. We love the fiery taste from the ginger and the crunchiness of them and they also hold together really well when dunked. 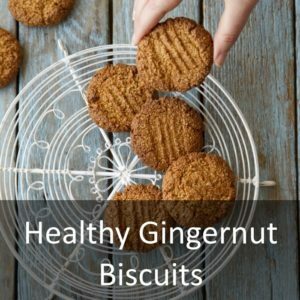 These are Healthy Gingernut Biscuits, and vegan and gluten free too. What makes these biscuits healthy? Well, they are not packed with sugar and butter like regular biscuits are and instead they use a little bit of maple syrup to sweeten them. I have also skipped the regular flour and used almond and cashew flour instead, which means they are gluten free and vegan too. Do Gingernut Biscuits Contain Nuts? Traditionally, gingernut biscuits don’t actually have nuts in them. Weird! Apparently they are called gignernuts because they are hard like a nut shell. Well, we have actually used nuts in the recipe for ours, so we can safely call them gingernuts. These are one of the most popular recipes from my first book, Hungry Healthy Happy. They are easy to make and don’t need any fancy ingredients, just like all the recipes in the book. If you want some healthier recipes to some of your favourite meals and desserts, then order a copy of the book. They Can Help Morning Sickness! When I was pregnant with my first, I lived on these for about the first 10 weeks of pregnancy. 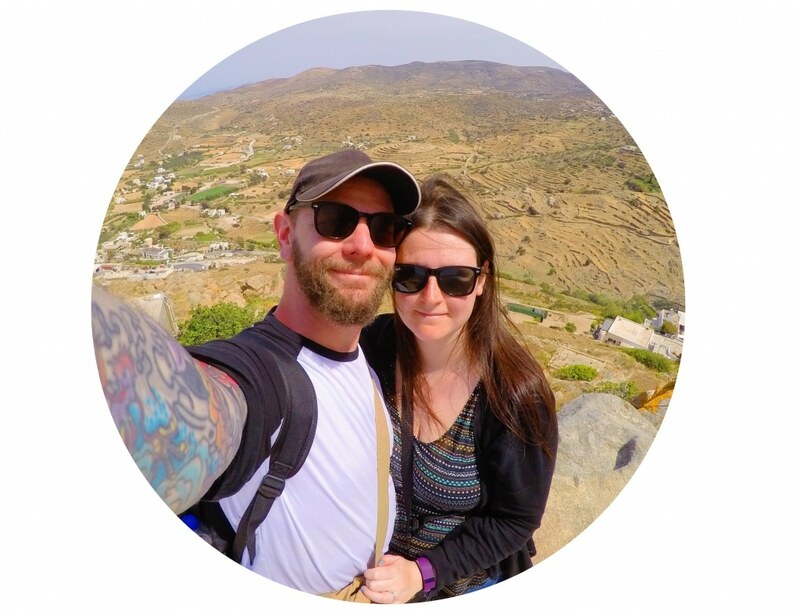 I suffered awful morning sickness and gingernut biscuits were the only thing that settled my stomach. Ginger is known to help with stomach issues and whilst I could have had some ginger tea or ginger ale, I opted for ginger biscuits because, well, pregnancy. Instead of raiding a whole pack of shop bought ones, I made them myself. I can sometimes find vegan and gluten free biscuits a little bland, and sometimes soft – these are neither. By making a flour with nuts, they are gluten free and everything is vegan too. How Many Calories in Gingernut Biscuits? These aren’t the most low calorie biscuits, at 137 calories per biscuit, because they are made with nuts. However, they are bigger than a store bought gingernut, which has 55 calories in it, and are much more filling because of the nuts. So, it’s not all about the calories, it’s the ingredients too. We have frozen them, and whilst they are a perfectly acceptable biscuit when defrosted, they do lose their crunch. A gingernut is all about the crunch for us, so I would say these are best made from fresh. Place the cashews, almond and coconut in to a food processor and blend until a flour like consistency. Transfer in to a large bowl. Using your hands roll the dough in to 8 equal sized balls and place on a baking tray lined with baking paper, evenly spaced. Using the palm of your hand, flatten each ball so they have a diameter of about 3 inches; this will ensure they crisp up nicely. Put the baking tray of biscuits in a preheated oven at 180C for 16 minutes until golden. Leave to cool on the baking sheet for 5 minutes and then transfer to a cooling rack and allow to cool completely before eating. Add some dark chocolate chips or raisins for a little extra flavour. Don’t feel like you have to stick to almonds and cashews – try using walnuts and pecans too. Gingernut biscuits hold a special place in my heart because they were always an after school treat when I was little. These, however, are Healthy Gingernut Biscuits. Preheat the oven to 180°C/350°F. Line a large , flat baking sheet with baking parchment. Place the cashews, almond and coconut into a food processor and process to a fine, floury consistency. Transfer the mixture to a large mixing bowl. Add the salt, baking powder, ground ginger, lemon juice and maple syrup to a bowl and mix well to form a dough. Using the palm of your hand, flatten each ball to a diameter of 7.5cm/3 inches; this will ensure that your biscuits crisp up nicely. Don't feel like you have to stick to almonds and cashews - try using walnuts and pecans too. These biscuits are simply genius, no flour just nuts – who knew a healthy biscuit existed!? I have only just released that they don’t normally have nuts in. Yours look great they and I am so proud of you for having a book. A big well done.